As autumn draws in, men should spare a thought for the women of the world because it costs an extra £425 a year to keep a room comfortably warm for a woman. Explaining the annual thermostat wars in homes around the country, a survey by Duette Blinds reveals that over half of women like their homes to be around 24°C or hotter, whereas only 35% of men want their thermostat higher than 22°C. 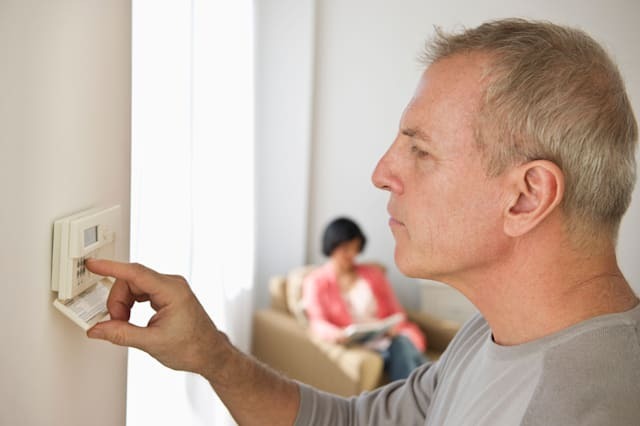 Nearly nine out of ten men admit to going round the house turning down the thermostat after their partner has put it up. But the research gives the lie to the popular myth that northerners are tougher than southerners, with people in the north setting their thermostat to an average of 25°C - 2°C higher than in the south. And given current fuel prices, households could save a staggering £400 a year if they were set at a level that's comfortable for men rather than women. "The results offer an interesting insight into the battle of the sexes going on in UK homes," says spokesperson Kirsty Hunt. "Government health advice puts the ideal living room temperature at 21°C and the rest of the house at 18°C as the optimum for health and wellbeing. Our poll found that one in 18 women would like their home as hot as 30°C (86F)!" According to new research from the Debt Advisory Centre, one in five Brits will go without heating at times this winter, and more than half are worried about how they'll pay their bills. Over a quarter say they'll even go without food to pay for heating. It's possible to save an average £85 a year for every degree the thermostat is turned down. Improving insulation, replacing older boilers and installing solar panels can help too - and a grant may be available. Switching suppliers regularly and paying by direct debit can also slash bills by hundreds of pounds. You can also get a free energy check from the Energy Saving Trust. You'll get a personalised report about your home, telling you how you can make big savings - often as much as £250 a year. "I'd urge consumers to take control of their energy bills before the cold weather starts to bite," says Ann Robinson, director of consumer policy at uSwitch.